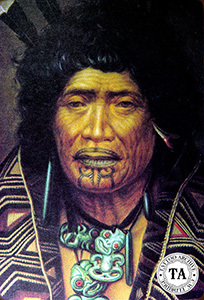 The native people of New Zealand, called the Maori, are world famous for their tattooing. Although they do not cover as much of the body as many South Pacific people, the Maori developed their own unique style of tattooing. 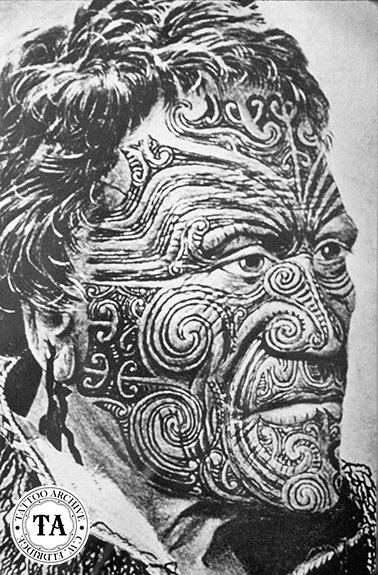 Working mostly on the face (Moko) and buttocks, the Maori took their wood carving technique and applied it to tattooing. With this they achieved a unique chiseled design into which they then rubbed ink. After the Europeans arrived in the 1700s bringing metals to these islands, the Maori began a more conventional style of puncture tattooing. Amazingly enough, this tattooing can still be seen in many museums around the world, not just in drawings or photographs, but also in the skin. 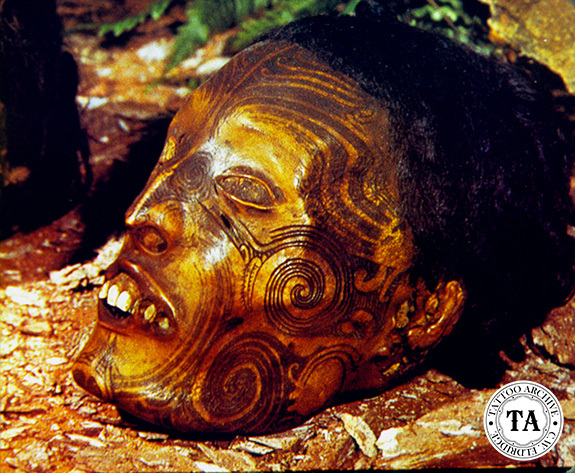 Because the Maori tattooed the face, they had a custom of removing and preserving the heads of their tattooed chiefs after death. The chiefs tattooing would tell the story of their lives and these heads would stay with the family and be an honored possession. European museums and collectors became interested in getting some of these heads to display as a curiosity. The Maori were eager to obtain firearms, ammunition and iron implements and as a result, a brisk traffic in baked heads ensued. 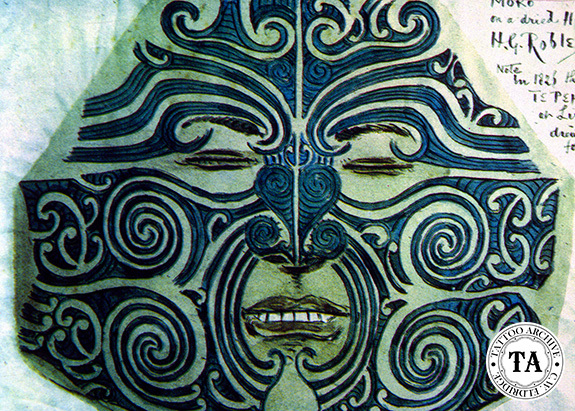 The Maori were not eager to trade family members heads so heads of prisoners and slaves were tattooed and traded. The first dried head to be possessed by a European was acquired on January 20, 1770. It was brought by Mr. (later Sir Joseph) Banks, who was with Captain Cook's expedition as a naturalist, and was one of four brought on board the Endeavour for inspection. It was the head of a youth of fourteen or fifteen, who had been killed by a blow that fractured his skull. The three other heads, not for sale, seemed to have false eyes and ornaments in the ears. The Rev. J.S. Wood says: "In the first place no man who was well tattooed was safe for an hour unless he was a great chief, for he might be at any time watched until he was off his guard and then knocked down and killed, and his head sold to the traders”. Old grudges were raked up and small wars undertaken to keep up supply. "But the trade began to grow in importance and at length agents were sent to select the best specimens, and "baked heads" acquired a separate entry among the imports at the Sydney customs, and it was not uncommon thing to find them offered for sale in the streets of that city". Today there is a move afoot to return the collections to the Maori people. Ireland is the first country to formally make this decision, but more are sure to follow. While this might be considered a loss to the tattoo historian as well as the interested public, it is fitting that they be returned to their rightful resting place.